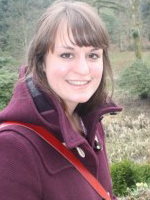 Amy is a NERC-funded doctoral student on the DTP in Environmental Research, and is based in the Climate Research Lab in the School of Geography and the Environment. She graduated from the University of Oxford with a BA in Geography (First Class) in 2014. Since undergraduate level Amy has been interested in the role of climate models over the African continent, and her DPhil research focuses on the ability of different numerical model products to represent rainfall over the Congo basin. Alongside her DPhil, Amy is joint- Meteorological Observer at the Radcliffe Meteorological Station. She has taught first year undergraduate Earth Observations tutorials and revision classes, and has been a human and physical Geography tutor for international students at Oxford Summer Courses. In 2017 Amy undertook a three month fellowship at the Parliamentary Office of Science and Technology, providing impartial and accessible science analysis to MPs and Peers. During her time at POST she wrote a policy briefing on Earth Observations. She was nominated to attend the Global Young Scientists Summit in Singapore in January 2017 as a representative from Oxford. Amy is interested in the way that different climate model products represent rainfall and convection over the Congo basin. The Congo is one of the three main convective centres on the planet, and therefore one of the key drivers of the tropical circulation. Convection in this region is a significant contributor to global rainfall, particularly during transition seasons. Additionally, the forests of the region are globally significant with regards to the carbon cycle, yet during the dry seasons they are extremely vulnerable due to their proximity to the rainfall threshold which supports a savannah ecosystem over rainforest. However, whilst the significance of the Congo basin is widely recognised, there is a lack of available observational data in the region due to inaccessibility and political tensions, and as a result there is a critical paucity of research on Congo climate dynamics. It follows that there is limited understanding of the region's climatology, in particular the controls on rainfall and the extent to which numerical climate models are able to simulate its climate. Amy's research aims to circumvent some of these difficulties by assessing dynamical and thermodynamical mechanisms in models relative to one another, rather than relying on the scarce and unreliable observational data. She also hopes to utilise some new, high resolution model products as part of the NERC and DFID funded projects IMPALA and UMFULA, to further her understanding of modelled tropical dynamics. Creese, A. and Washington, R. (2016) Using qflux to constrain modeled Congo Basin rainfall in the CMIP5 ensemble. Journal of Geophysical Research: Atmospheres, 121(22): 13415-13442. Creese, A. and Pokam, W. (2016) Central Africa: Understanding the Regional Climate System. In, Future Climate for Africa (2016) Africa's Climate: Helping Decision-Makers Make Sense of Climate Information.